It’s getting to the point in Emily Thorne’s stay in the Hamptons where it’s hard to tell who is the more malevolent force between her and the Graysons. The Graysons are the rot, the festering wound that brought her there and that won’t ever seem to close, growing larger and more grotesque by the day. Emily, though, is the one who keeps picking at this wound; pushing and pulling at the damn thing so it can’t even think of closing. Every time she makes a move against them, they in turn do something so much worse that forces the question: Is Emily’s quest to avenge her father really worth it? In the past, Revenge has dealt with the greater ramifications of Emily’s quest to bring down the Graysons in great detail, exploring how much it affected her and the people that surround her. The second half of this season has mostly abandoned this introspection in favor of plot shenanigans, which has been a welcome development for the watchability of the show but, in moments like Pascal’s gruesome murder, sets off the little alarm in the back of the brain that wonders if all of this is worth it. How many people have to die before Emily gets her final revenge? And does it even matter how many people die? These questions are the things that, in the show’s recent renaissance of soapy madness, may almost be beside the point. 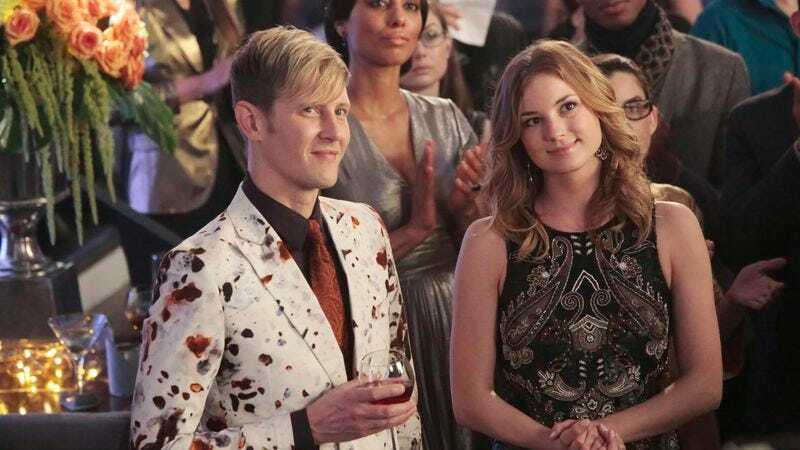 Revenge is working very hard right now to twist all of its characters into the perfect little plot knots so almost everything on the show works in symbiosis, so pulling on one thread tightens the knot on another. Now that the Pascal story is paying off, looking back on all of the things the writers did to get him on top of that roof with Conrad, to get him to a place where Conrad killing him by shoving him into a helicopter blade made perfect, nonsense sense, is pretty darn impressive. Pascal’s death not only turns Conrad into an actual, hands-on murderer (rather than just the disgusting, hands-off murderer he was before), but it also emotionally devastates both Margaux and Victoria, makes Margaux the sole CEO of the company (and prime target for whatever evil thing Evil Daniel decides to come up with next), and ultimately adds to Victoria’s ever-growing arsenal of suspicion when it comes to Emily Thorne. If the plotting is this fun, the finer character work—like concern for the ever-growing rot of Emily’s soul—can easily slide by for a while. While all of the impressively interconnected action was happening with Emily, Pascal, and the Graysons, however, Charlotte was the focus of her own, decidedly disconnected storyline—and for the first time, it wasn’t terrible! This is mostly because the story of Charlotte receiving letters from David Clarke beyond the grave and then getting kidnapped by some sort of deranged stalker person is so absolutely, completely ridiculous that it turns right back around into being fun (at least for a little while). Personally, I was rooting for a gaslighting story where someone convinced Charlotte her father was alive over a long period, but her getting abducted by her deranged attacker—whoever he may be and whatever he may want—is just crazy enough to work. If Revenge insists on keeping Charlotte around, making her the Kelly Taylor of the show is the least objectionable way to go. She’s already had a drug problem, a miscarriage, and been kidnapped. Maybe next she can join a cult! Victoria now knows Emily was trying to frame her on the boat and strongly suspects Emily was impersonating a Homeland Security agent. How long until they have their big confrontation? The one part of the Pascal plot that never really worked was his “epic” romance with Victoria. Their proposal and supposed longtime love story always felt too rushed and underdeveloped to really land, emotionally speaking. Emily’s undercover mission was fun, even if it ultimately didn’t go anywhere. Also, wasn’t Pascal wearing a wire when he died? Won’t the police find that and think it’s strange? Evil Daniel is all-in on being evil, manipulating Margaux into getting her father to get the CEO promise in writing, and arranging to have Pascal extradited via his Interpol friend, even knowing how much it would hurt his mother. Daniel, your Conrad is showing.